Nothing restores your mind and body like a good night's sleep. And nothing helps you sleep like the Waterbase Pillow from Mediflow. It combines the therapeutic benefits of the Waterbase design with soft, hypoallergenic polyester fibre for luxurious, all-round comfort. Clinically shown to improve sleep and reduce neck pain. Proper selection of a pillow can significantly reduce neck pain and improve quality of sleep. 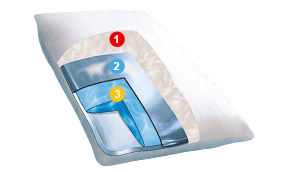 Unique, patented Waterbase design provides responsive support to neck and head while continuously adapting to changing sleep positions.